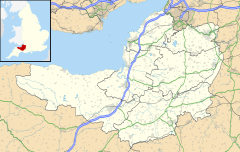 Bratton Seymour is a village and civil parish in Somerset, England, situated on a tributary of the River Brue 4 miles (6.4 km) south-east of Castle Cary and 4 miles (6.4 km) north-west of Wincanton in the South Somerset district. The parish has a population of 104. The remains of a Roman villa, dating from 222-386, were discovered on Cattle Hill in 1966. Bratton manor was held, like Wincanton, by Alfsi in 1066 and by Walter of Douai by the time of the Domesday Book in 1086, when it was known as Broctune meaning settlement on the brook. In the late 12th century land in the parish was given to Bruton Abbey, and later the lord of the manor were the Seymour family, whose name was incorporated into the village name. The parish of Bratton Seymour was part of the Norton Ferris Hundred. A junction of the A371 just south of the village is known as Jack White's Gibbet as it was the site of the hanging of White for the murder of Robert Sutton in 1730. The Anglican parish Church of St Nicholas has Saxon origins. It was originally dedicated to St. Giles, and has also been known as Holy Trinity Church. It is designated as a Grade II* listed building. ^ a b c Bush, Robin (1994). Somerset: The complete guide. Wimborne, Dorset: Dovecote Press. pp. 36–37. ISBN 1-874336-26-1. ^ "Bratton Seymour". Victoria County History. British History Online. Retrieved 28 November 2008. ^ "Somerset Hundreds". GENUKI. Retrieved 18 October 2011. ^ "Church of St. Nicholas". Images of England. English Heritage. Retrieved 28 November 2008. This page was last edited on 20 July 2018, at 22:01 (UTC).